You can find any announcements here. Use mode 1 with care and when not used disabled it. If you don't need mode 1 MODE: I[_] ! !DISABLE IT!! If you use mode 1, make sure you limit the access to the server you want to have it access to. as proxy to go to other severs. We are working on an update, so you can preset a list of the allowed outgoing ip:port pairs instead of the ip addresses only. So far we are using this new client with the repeater, we have restricted access on the Firewall for the Viewer port only from our network, we also use other ports instead of the standard ones and... we are using the Secure Plugin with certificates. I think our setup is safe... right? In mode I, the viewer ask to open port A to ip X. You need te make sure the the repeater can only connect to predefined ip:port and disallow all other connections. Rudi De Vos wrote: In mode I, the viewer ask to open port A to ip X. In Mode I, even if the port is not open to the Internet, you know, blocked on the Firewall, any viewer can still establish a connection? Because as it stands now, only the server port is exposed to the internet and the firewall on the server the repeater is running, only accepts viewer connections from our local network. EDIT: And yes, all other ports not in use in that server are blocked. 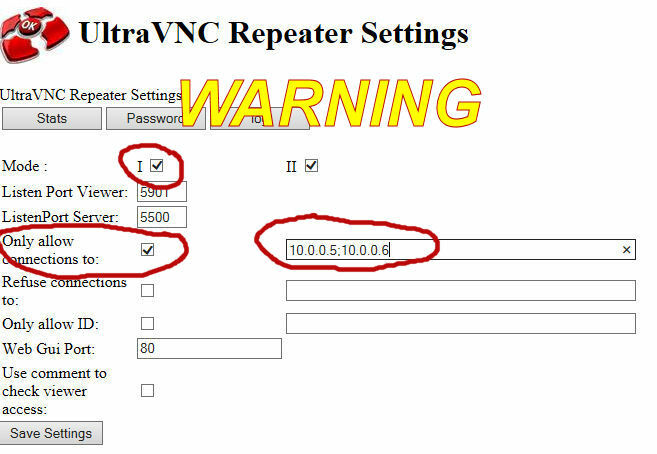 The warning is for the repeater software. Natural, you can use a firewall todo the same, but then it's up to you. The repeater is not available today - is this some kind of temporary problem or it's being removed from the uvnc family ? another question is : will modern uvnc servers support connecting through the repeater ? Forum links are usual test links, we try to keep the server links all up and runnning. If some server link doesn't work, please notify us so we can check the security settings on the download server. Sometimes settings are bad after a loadbalance switch. How to run new repeater on Arch linux with Arm Processor? ?